Portlandia. The show very much a part of a mini-movement. And no, not just keeping the dream of the 90s alive in the titular city but also playing a major part in the burgeoning of comedy scene on IFC. It wasn’t the first funny series to hit the Independent Film Channel. However, in many ways it has become the staple. Sort of how It’s Always Sunny in Philadelphia was a landmark on FX (Perhaps every network needs to adopt a city and stick it in the title?). Portlandia Season 2 features many returning favorites from Season 1, as well as several new characters, a bit more structure and ten episodes instead of six. Even with the expansion there is still a sense of ‘second verse same as the first’ so if you were a fan of Fred Armisen and Carrie Brownstein’s Oregonian sketch comedy exploits the first time around then you should definitely be visiting the second season. 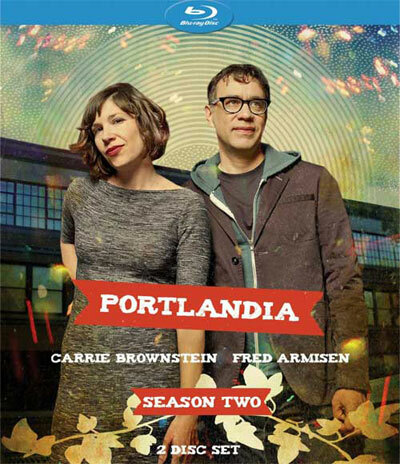 Most of the episodes follow a main story, often Fred and Carrie’s adventures in character, to provide Portlandia a loose structure to hang the rest of the scenes. At its heart, the show is sketch-based--which inherently lends itself to a hit or miss experience. That’s not to say the show mirrors the intermittent quality of something like SNL, but it does say a viewer cannot expect to connect with each and every bit, which could potentially render large chunks of the season unappealing. Of course, Portlandia has much more time to script, shoot and select the exact elements that make up a given sketch than Lorne Michaels’ iconic series (there are no last half-hour dumps or a slow week) so even your least favorite sketches usually contain more than a few laughs. And besides, the beauty of owning the series is the ability to quickly skip any short segment that doesn’t appeal (like the Feminist Bookstore). What?! I know Toni and Candace are often regarded as one of the main draws of Portlandia but that particular setting has rarely worked for me , at least since the first hilarious encounter there with Season 1 guest star Steve Buscemi. They still have their moments (especially when playing second fiddle like they did in the excellent finale, Episode 10, “Brunch Village”) but I’d rather spend my time in the city with other returning characters and their bizarre one-off situations. This obviously made the eighth episode, “Feminist Bookstore's 10th Anniversary,” one of my least favorite of the year, but others like “One Moore Episode,” “Cops Redesign,” “No Olympics” and the aforementioned finale make the season well worth owning, especially since the extended edition of “Brunch Village” (including director Jonathan Krisel’s behind-the-scenes marionberry adventure) only appears on the home release. Before expanding on the surprisingly awesome, albeit few, special features, it’s worth noting some of the excellent individual sketches and awesome guest spots littered throughout Portlandia Season 2. I’m not sure if any of the Season 2 sketches hit me as hard or resonate as much as “Technology Loop,” but there were some amazing moments with both returning characters (“The Cabinet of Dr. Caligari,” ”Dream of the 1890s” and “No Bag at the Supermarket”) and new ones (“Put a Bird on It,” “Whose Dog is This?” and “Husband Sitter”). Also, the IFC series certainly has no trouble bringing in comedians and other celebrities for guest spots. These include SNL regulars like Andy Samberg (“SoCal”) and Kristen Wiig (“CatNap”) to Oregonians like Eddie Veder (“Eddie Veder Tattoo”). Without a doubt, well, aside from Kyle MacLachlan’s amazing return as the Mayor (as well as the real Mayor of Portland Sam Adams once again playing his assistant), Ed Begley Jr.’s appearance in Episode 10 was my favorite. As far as the extras go, the set features some run of the mill special features, as well as a few real gems. As you can imagine, I wasn’t too amped up for the deleted scene from “Feminist Bookstore,” but it was fine. Four episodes feature commentary from Armisen, Brownstein and Krisel and, as expected, they were both insightful and pretty funny. The look at both “Portlandia The Tour: Seattle” and an excerpt from the “Portlandia: A Guide For Visitors” book (released yesterday) were also interesting but not something I would see myself revisiting. However, as I said before, “Bunch Village: The Director’s Cut” was probably my favorite thing about the entire second season and alone worth the price of the DVD and/or Blu-ray. Krisel’s search for the perfect Marionberry pancakes with guests Lorne Michaels and Bobby Flay is a great faux behind-the-scenes topper to the already incredible installment. Finally, the “Inside Portlandia” special, directed by the always rad Lance Bangs, offers an in depth look at the first two seasons of Portlandia, discussing everything from the concept and amazing opening titles (my favorite on TV) to the great guest stars. Season 3 of Portlandia premieres with back-to-back episodes on Friday, January 4 at 10 p.m. ET on IFC. And don’t miss the special “Winter in Portlandia” special on Friday, December 14 at 10:30 p.m. ET.